After more than four years of work, the 71m high North tower of Saint-Sulpice church has been restored. It is a place of worship, but also a symbol of the district and a place of history and fiction, a portrait of this great dame which is St Sulpice church. 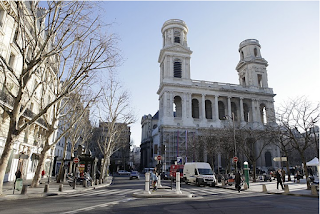 Since the first stone was laid by Anne of Austria in 1646, the construction of Saint-Sulpice church continued for 130 years, with a number of developments, and the building was not completed until 1870. Its 71 metre high North tower is adorned with four statues of Evangelists, each one weighing 20 tonnes. The tower suffered a lot of damage in 1871, under fire from Prussian shells. Restoration work followed, sometimes causing irreparable damage. Read more.